The sessions are recorded and can be viewed by attendees later. This document is a manual for instructors who want to conduct live sessions (courses, webinars) on Perculus Plus. 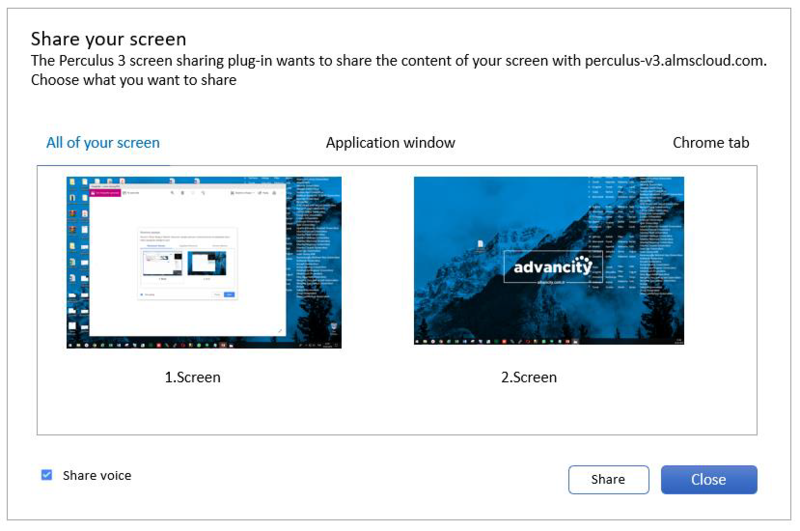 - Perculus Screen Sharing Plugin on Chrome for screen sharing. This can be downloaded from Google Webstore. The attendees (users except for administrators and instructors) wait in the lobby and can chat with other attendees here. Also, whenever the instructor gives a break, the attendees are taken here again. It’s a good practice to test camera, microphone, and bandwidth capacity. You can open up the system check dialog by clicking the System Check link in the session menu. 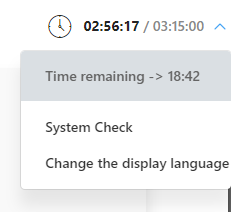 In the first step of system testing pane, you can see the status of your computer capabilities. If you want to use live video or audio streaming, you need to have a web camera and a microphone installed. 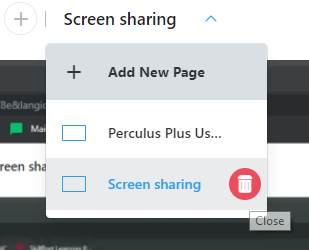 In order to share your screen in Chrome, Perculus 3 Screen Sharing Extension should be installed. You can select one of the cameras installed on your system to make it your default camera. When you live stream, the selected camera is used. You can change your default camera in this pane whenever you want. When you select a camera from the list, you should see the camera view. If you see it, you can click “Camera is working” and proceed to the next step. 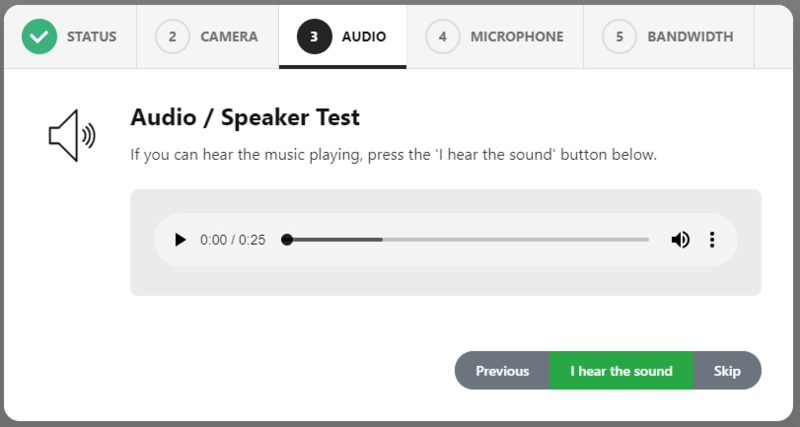 If you can hear the music being played from your speaker / headset, you can continue by pressing the ”I hear the sound” button. If you cannot hear the sound, you need to make sure your speaker or headset is working properly. In the microphone step, the microphones available on your device are listed. When you select the microphone you want to use in the session, the microphone level bar is displayed, and as you speak, it will move accordingly. This indicates that your microphone is working. By clicking “Next”, you can go to the next page. If there is no microphone listed here, you need to make sure that there is a microphone connected to your device. Sufficient bandwidth is one of the most important requirements of a live session. If you live stream with your webcam, you need a minimum upload bandwidth of 250 Kb/s. For screen sharing, it is around 500 Kb/s. So, for good user experience, the recommended bandwidth rate is above 1 Mbit/s for upload and download. 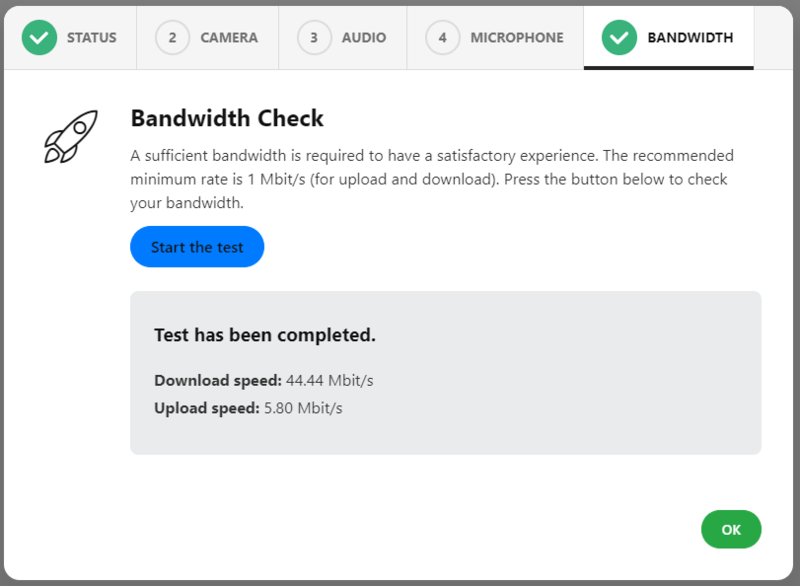 The test results in this step show you your upload and download bandwidth rates. If you click this link, a language selection dialog gets opened where you can change the display language to one of the supported languages. The documents, the whiteboard and the screen that are shared by the instructor in the content area can be viewed from the user panel. The current image of the whiteboard or the document that is open in the content area can be downloaded by clicking the icon at the bottom left. To request permission for sharing from the instructor, click the icon at the bottom right of the content area. 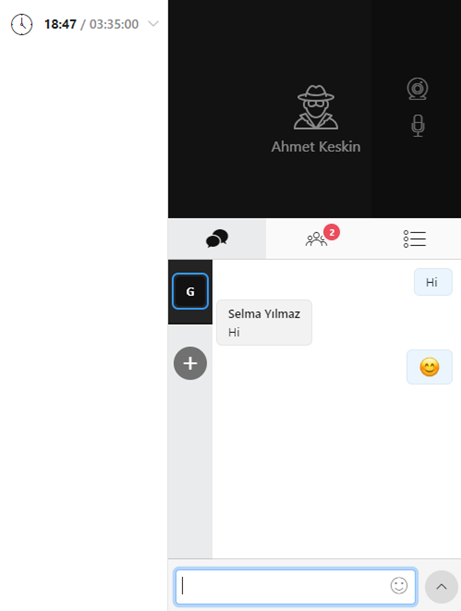 The chat panel can be displayed by clicking the icon below the camera section. All users can see the messages in the tab. New chat tabs can be added through this icon to message with other attendees privately. 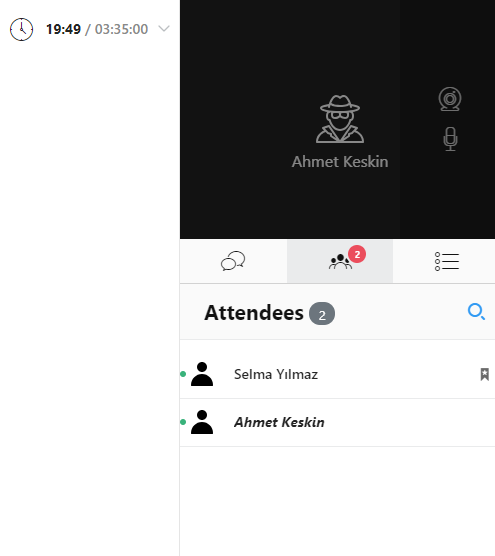 The Attendees panel can be displayed by clicking the icon below the camera section. 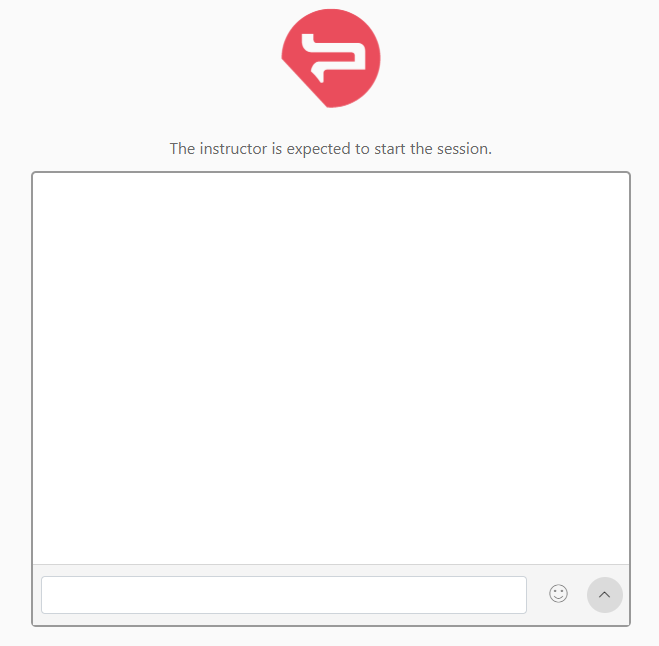 To respond to questions asked by the instructor, click the icon below the Camera section. At the time the question is published, the question will appear automatically on the screen of the attendees. During the session, the instructor may want to open to turn your camera or microphone on. In this case, you are asked to allow or not. Your camera or microphone cannot be turned on automatically. The instructor can permit you to share content as well. Then, you are notified as follows and can share your content on whiteboard until your permission is revoked. 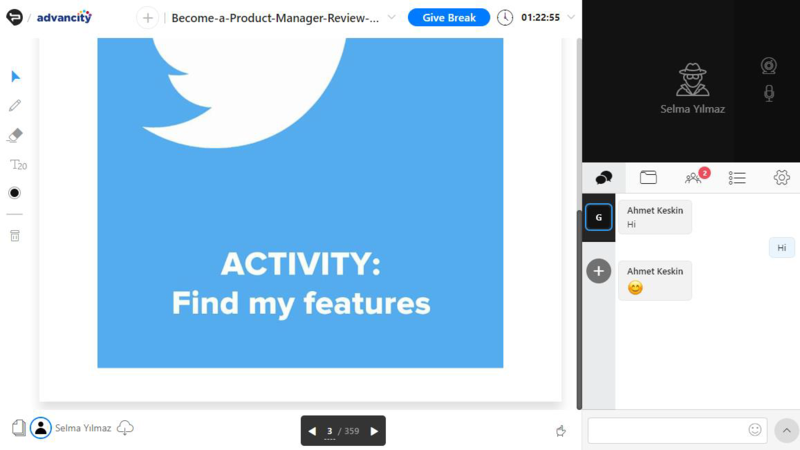 Clicking the + button on the top center of the screen and selecting the whiteboard tool, drawing and text tools appear on the left, and an area with a light grey background also appears. Pencil , eraser , text , colour selection and trash tools appear in the left menu. These tools can be used on the whiteboard. By clicking the button located on the lower left corner of the page, the current whiteboard image can be downloaded. This is useful for saving the drawings and texts with the image or presentation displayed. Clicking on the + button on the top centre of the screen and selecting “Upload Document” opens a window to upload documents and videos from your device. The upload status can be monitored on the bottom of the files section in the right panel. You can select a pre-uploaded document, video or image from the Files section which is under the camera/microphone area. Only files in pdf, jpeg, png, mp4 (video) and mp3 (audio) formats can be uploaded. Therefore, if you want to share an MS Office document, first you need to convert it to PDF. Video and audio files are played or paused synchronously with other attendees. When a document or an image is open in the common area, drawing and text tools appear in the left panel. The image of the document on the screen can be downloaded by clicking the button located on the bottom left corner of the page. You can also display thumbnails of a shared document by clicking the icon on the lower left corner. Then, you can jump to a specific page without navigating through all the pages of that document. 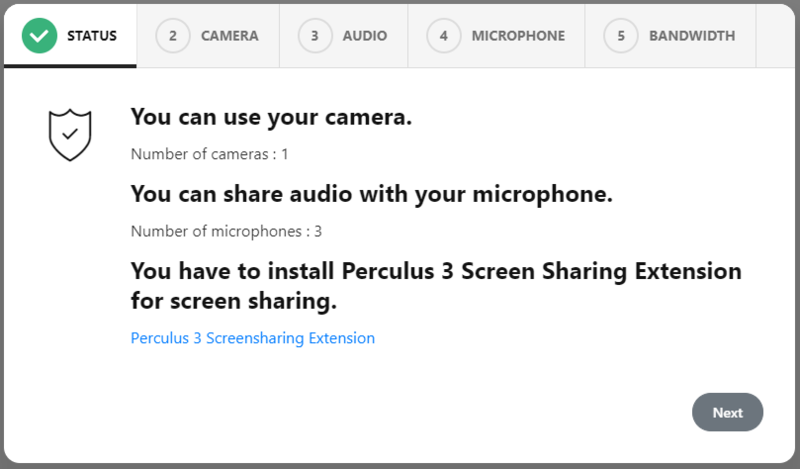 For screen sharing, Perculus 3 screen sharing plug-in must be installed to the Google Chrome browser. 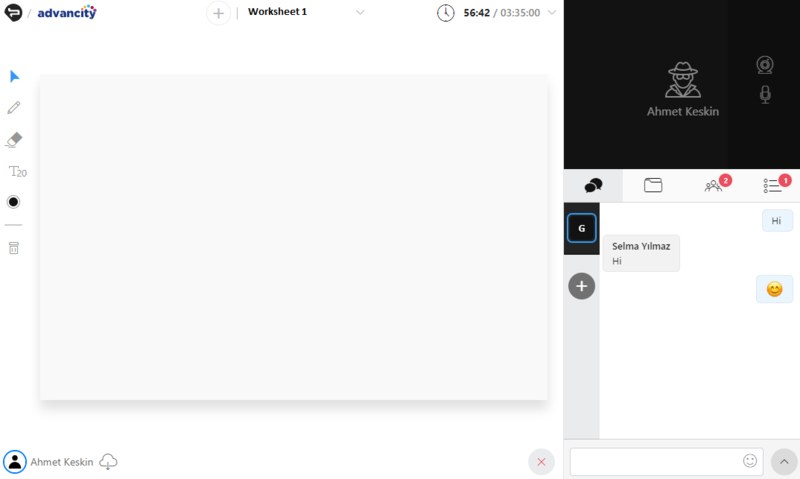 Clicking the + button on the top centre of the screen and selecting “Screen Sharing” item will bring up the screen sharing window. The first tab in the window is for sharing the entire screen. If you have more than one screen, you can select one of them. The application window tab is used to select and share an application window of a running program. When you minimize the application window, it’s not shared until you open the window again. Also, even if you resize or move the window, sharing continues. If an open browser tab in Google Chrome is to be shared, it can be selected in the tab titled “Chrome tab”. Opening other tabs during screen sharing does not stop sharing of this tab. 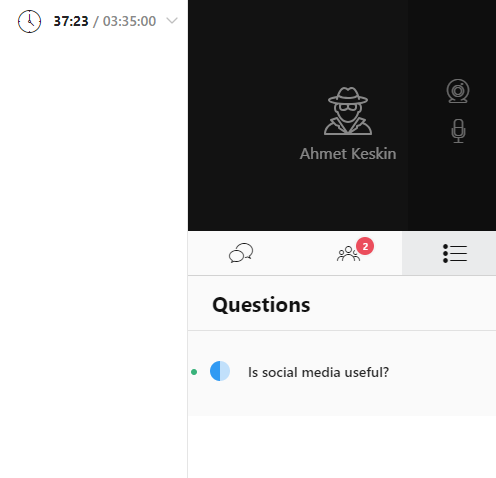 To stop screen sharing, click on the sharing section on the top and click on the trash icon on the right of the screen sharing tab as shown in the image below.